if it gets stuck in your head properly. According to CBC.ca, a team at Sunnybrook Health Sciences in Toronto, Canada, is using this new technology to treat patients who suffer from "essential tremors", a debilitating disease that threatens the quality of life dramatically in whom it afflicts. 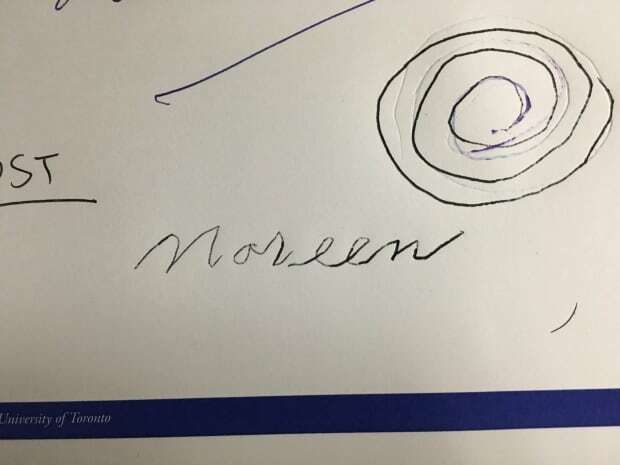 Essential tremors, while not life-threatening, cause spasms that make victims spasm in a manner that could stop them from doing tasks as simple as holding a glass or writing their name. 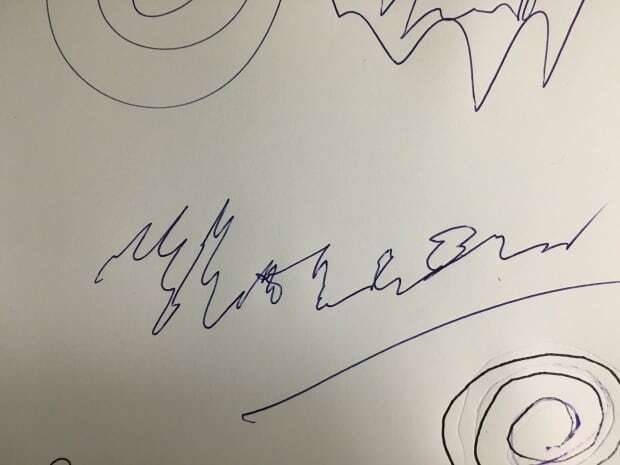 The pre-op signature of Maureen, one of the patients in the study. Forty patients have been selected for the clinical trial. The process involves the afflicted patients undergoing an "MRI-guided focused ultrasound" wherein the focus of the ultrasound targets the specific troublesome neurons in the brain's thalamus that are responsible for the tremors. While in an MRI machine, the doctors can "see" the affected areas, and use pulses of ultrasonic sound to break up the neurons desired. Sunnybrook neurosurgeon Dr. Nir Lipsman extolled, "This is a game changer...It really changes the way we think about surgical treatments for tremor. No scalpel needed. No drill needed." In Dr. Lipsman's initial study of 76 patients, 47% saw improvement within 3 months of treatment, with 40% reporting marked improvements within the year. Side effects only included some gait disturbance and numbness. The procedure takes about four hours. danced an Irish jig with joy at the cure. This take on technology could feasibly rewrite the book for the methodology behind a variety of surgeries. Dr. Kullervo Hynynen, director of physical sciences at Sunnybrook Research Institute and part of the technique's development team, states the ultrasonic surgery "will open up a new era that will revolutionize the way brain diseases will be treated, eventually benefitting millions of patients." Good soundwaves...is there anything they can't do? In the field of medicine, brain surgery is considered as a standout amongst the most fragile operations, which is performed by specialists. Be that as it may, with the assistance of most recent research it has been discovered that this occupation is not any more troublesome as doctors soon might paint tumors that will help in expanding order coursework online the imperceptibility of tumors. This would be conceivable with the assistance of nature's deadliest venom of Scorpions. Click on the following link if you're interested in reverse phone lookup! Very helpful and informative article. It was a pleasure reading it. This new technology opens the way for newcomers to brain injury. Do you have a spam issue on this website; I also am a blogger, and I wanted to know your situation; many of us have developed some nice methods, and we are looking to trade methods with others, why not shoot me an e-mail if interested.